Sausage Pancake Muffins - pigs in a blanket muffins. 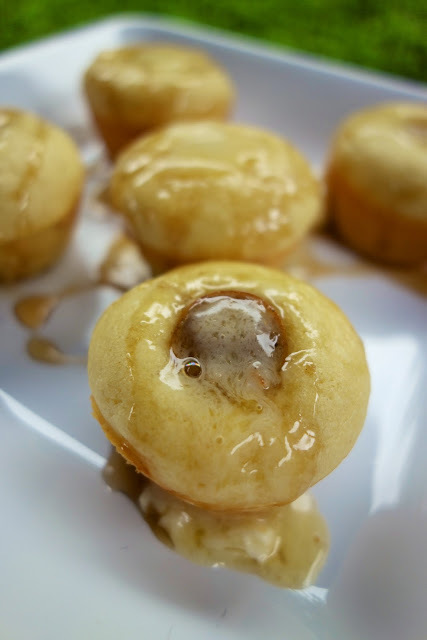 Homemade pancake batter baked in mini muffin pans with a sausage slice in each muffin. So quick and easy. Great weekday breakfast! Serve with additional maple syrup. YUM! This is a variation of my Blueberry Baked Pancakes. Instead of baking the pancake mixture in a square pan, I turned them into little pancake muffins. To really put these over the top, I stuffed a sausage link in the middle of each one before baking. YUM! These were SO delicious and they are super easy to make. I whipped up the batter in less than 5 minutes. I used precooked turkey sausage links to cut down on time and fat. I couldn't tell it was turkey sausage; it tasted great. 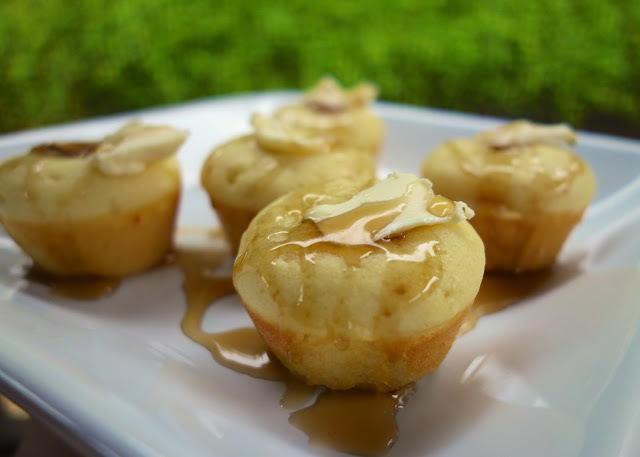 Top these muffins with some butter and maple syrup or just pop them in your mouth right out of the pan! Preheat oven to 350ºF. Lightly grease mini muffin pans. In a large mixing bowl, whisk together milk, butter, egg, vanilla, and maple syrup. Add sugar, flour, baking powder and salt. Scoop 1tablespoon of batter into each muffin cup. Place one slice of sausage link into the center of each muffin. Bake for 10-12 minutes. Serve with butter and maple syrup. These look soooo good. I'm at work sneaking a peek and this just made me really hungry. Totally yum! Love this idea. Any thoughts on whether we can make the batter ahead of time and refrigerate until ready to use? Thanks for the great recipe! The batter has a really nice flavor. I used maple flavored sausage which added to the maple flavor. Next time I will double maybe even triple the recipe as they are great to heat up in the morning or for eating on the run. Thanks again! I made these for the kids' breakfasts. They didn't last as long as I'd hoped they would, but that's alright, next time I'll make LOTS more! They obviously liked them a lot! After these cooled completely, I put them on a cookie sheet lined with wax paper, and stuck it in the freezer until they were firm. Then I took them out and put them in FoodSaver bags and sealed them up. These reheated very well in the microwave and made for an easy breakfast for the kids. It took about 30 seconds for 3 of these. Just microwave at 30 second intervals until they are warm. The only thing I changed was the sausage. I used regular breakfast sausage links in place of turkey links. Just a personal preference there. Now, I better get back in that kitchen and whip up more of these little suckers! LOL Thanks for a great recipe Steph!